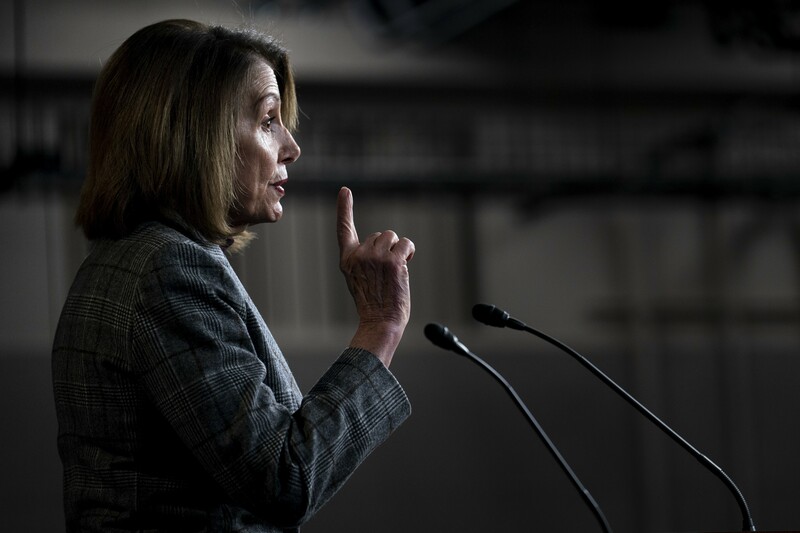 House Speaker Nancy Pelosi (D-Calif.) speaks at a weekly news conference on Capitol Hill in Washington, Feb. 28, 2019. The House voted Thursday to extend the time allotted for the FBI to conduct background checks for gun purchasers flagged by the national instant check system, the second major gun control bill to clear the chamber this week after two decades of inaction. WASHINGTON — The House voted Thursday to extend the time allotted for the FBI to conduct background checks for gun purchasers flagged by the national instant check system, the second major gun control bill to clear the chamber this week after two decades of inaction. Democratic leaders also succeeded in quelling a small rebellion among freshman Democrats from Republican-leaning districts, persuading them to oppose a politically freighted Republican procedural motion after they backed a similar motion Wednesday. The 228-198 vote aims to extend the background check review period for gun purchasers to 10 days. Currently, the FBI must perform its review and determine whether there is sufficient evidence to deny a purchase in three business days. If it cannot complete the review within that time, a buyer may return to the dealer on the fourth day to purchase a firearm. That provision in current law allowed Dylann Roof to purchase a handgun and kill nine people at a historic black church in Charleston, South Carolina, in 2015, even though he should have been denied his firearm. “Let’s give the FBI, the authorities, enough time to do their job and save lives,” Rep. James Clyburn, D-S.C., the majority whip and the bill’s sponsor, implored his colleagues from the House floor. Both gun control bills that cleared the House this week face dim prospects in the Senate, but they were cause for celebration for the gun-control activists that mobilized last year after a series of mass shootings. While Thursday’s bill was expected to easily clear the Democrat-controlled chamber, a dose of drama was added after House Republicans staged a successful ambush during the vote on the first gun control measure Wednesday. Republicans offered a provision that would require the FBI to alert Immigration and Customs Enforcement if an immigrant living in the country without legal authorization tried to obtain a firearm. Twenty-six Democrats broke party lines to support the measure, catching Democratic leadership off guard. House Republicans tried a repeat ambush Thursday, surprising Democrats with a last-minute motion to exempt victims of domestic abuse from the new 10-day waiting period. This time, following strict marching orders from Speaker Nancy Pelosi, the motion failed, with only two Democrats voting for the measure.